The perfect gift box for any connoisseur and lover of fine chocolates. The Lindt Lindor Chocolate Gift Box is superb gift and jam packed with luxury chocolates that are bursting with flavour and something to take everyone’s fancy. Lindt Chocolate Hamper is the perfect gift box for any chocoholic and lover of fine delectable flavours. This superb chocolate gift box is jam packed with luxury chocolates, with flavours including milk, chocolate orange, assorted strawberries and cream chocolate truffles, we have also included a box of mini pralines. Something to take everyone’s fancy. Presented in a black lidded box and finished with a hand tied red bow. Presented in a black lidded cardboard box and finished with a hand tied red bow. Chocolate flavours as per description, may change with season. 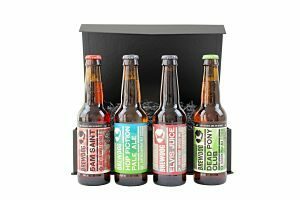 Perfect for gifting with a delectable variety of flavours. Inside this chocolate box you will find the best truffles Lindor has to offer; milk chocolate, white chocolate, extra dark chocolate and hazelnut milk chocolate truffles. A selection of Lindt’s Mini Pralinés. A fine box of miniature chocolates lovingly arranged in a cute pink chocolate gift box. A chic and informal gift or the ideal box for a moment of self-indulgence. Just add your favourite treats to make your picnic an all time special day with the Green Tweed Back Pack. A distinguished willow hamper, matching Tweed picnic blanket and flask cover to accompany the wooden effect cutlery. Choose either for 2 or 4 person. 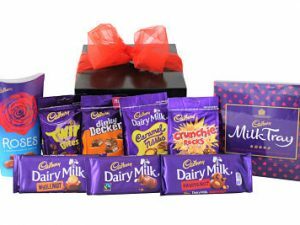 A gift that is both impressive and appreciated, the Cadbury’s Chocolate Gift Box is filled full family favourites and perfect for any chocolate lover.